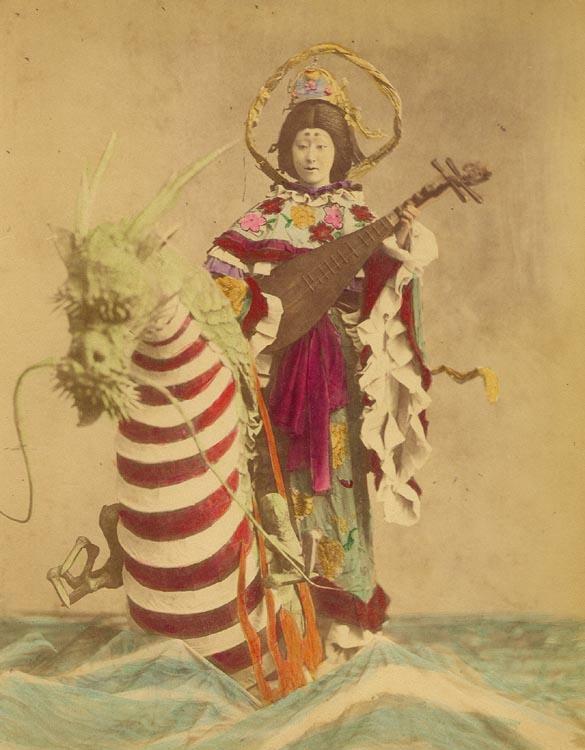 Benten, Benzaiten or Bensaitensama is the best known Japanese Goddess - she is even more popular as Amaterasu. She is actually Sarasvati who moved to Japan with Buddhism and was recognized as the Shinto Goddess Itsukushima Hime. 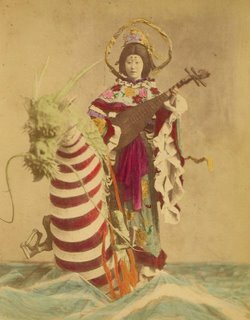 Benten is a dragon Goddess who is remembered at New Year. She is a water goddess - Sarasvati was originally mother of all rivers, but there are not so many rivers in Japan, and by emerging with Itsukushima Hime (Ichikishima-Hime) Benten become a sea Goddess. Ocean is the Mother of all things, the Universal Womb, and so is Benten. As such She is also the Goddess of all creation, and especially arts and crafts. In Japan technology is seen as a craft and all science is brought forth from arts. So Benten is also the Goddess of technology and science. Just like Sarasvati. Benten is often seen as the creative force of Nature - shakti, as it's called in Hinduism - and this forms an idea of that the Pantheistic nature of Shinto makes it actually a Goddess religion. It has quite a lot in common with general Neo-Paganism... no holy scriptures, no absolutes, free individual moral code, Divine Couple, pantheism... there's even a "cast" of "high priestesses", mikos. "Shinto emphasizes right practice, sensibility, and attitude." I am not very fond of Japanese food. My husband on the other hand is.